Playing with Traci Bautista's New Stencils! Playing with Traci Bautista’s New Stencils! Watch Playing with Traci Bautista’s stencil in my art journal on YouTube. Enjoyed the video? Have you signed up for my newsletter? I’d love for you to join me and as a thank you I’ve got an exclusive downloadable video only available to my newsletter friends. The giveaway for this hop is 2 random winners will receive a set of Traci’s 5 new stencils. You have until Sunday, July 27th at 11:59pm Central Time to leave your comments to be entered to win. The more blogs you comment on, the more chances you have to WIN! One comment per blog please, but you knew that. 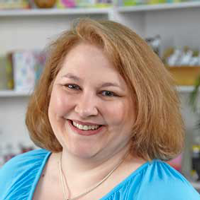 Carolyn Dube – You’re here! You know I LOVE circles and this is just fabulous! The punch of orange is just PERFECT!!!! Wow! Such a great effect with so little stuff! I agree that the orange punches are perfect. Orange is the new BLACK! And my favorite color so punching it up with the pink – simply heaven. Great idea with little product required — loved the idea – thanks for sharing. I love how quick and easy you can work on a page with a stencil and acrylic paints! Love your video and journal page! These new stencils are so beautiful! Thanks for your video, Carolyn — a treat to watch, as always! The color and the use of the writing makes this perfect. Love the finished piece. So excited for these stencils!!! Those colors thrill me!!!! I love pink and orange…haven’t used them in a while! Writing in the circles looks like fun!! As always, I LOVE your take on new things, but Traci’s stencils are a must-have for me! I always enjoy your videos. And I love the pink and orange. Circle + Words = Heaven! Love this colorful page…reminds of sherbet and I want to lick it! :))) but I won’t!!! That is a cool stencil! Love how you used it. I SO love your playfulness when you’re arting…just so much fun! You inspire me to just “play” with my pages! Love your fun page! Traci is such an amazing, creative spirit. I’m lucky to say that she lives in the bay area and have taken a few classes with her or just run into her at some of the local shops. I think her stencils have really unique potential, which is hard to find in the ever-expanding stencil arena. I love how you used this stencil! I posted the video on my FB page. Your videos are always so fun. I loved the one where you drug your husband in! Anyway, thanks for the chance to win these stencils! LOVE THEM! I love how you wrote in the circles and the colors are fabulous! Carolyn, I discovered your YouTube channel a couple of weeks ago and am hooked on your art. Thanks for sharing your talents. And I love the new stencil! Completely jel (as my daughters would say) of the new stencils! The color combo you used in the art is awesome. I love watching you pages come together! Hi, Thanks for a chance to win these fabulous stencils…I adore Traci’s work and would love to get my hands on these stencils. Your video was fun and inspiring (always enjoy your free spirit in your videos)…like the white acrylic paint within the circles…so many ways to add interest to these circles. I LOVE circles, too! The punch of orange is just PERFECT!! The handwritten text inside the circles gives your cover lots of character and expression. Thanks for sharing, Carolyn! The scribbly circles, the orange and pink, I LOVE IT!!!!! It’s so imperfect, which is what I’m now striving toward…..
Carolyn… more is always better… love the page. Great use of these new stencils by traci b! Just FUN! I LOVE Traci’s Circle stencil ! Cool stencil! Thanks for sharing! I love love love your colors & style with Traci’s stencils = perfect match! I love how you journaled in some circles then brought orange text paper (playing off the color the Posca pens) to other circles. Winner! Thanks for sharing again. Love, love, love Traci’s stencils. …..and that page is HOT! Always so interesting to see how everyone treats the same items differently. Great new stencils, and lots of new techniques also. Loved the video! And the stencil! Well I love organic circles, your point of view and Traci’s work that is so filled with abandon so this is a slam dunk winner!!!!!! 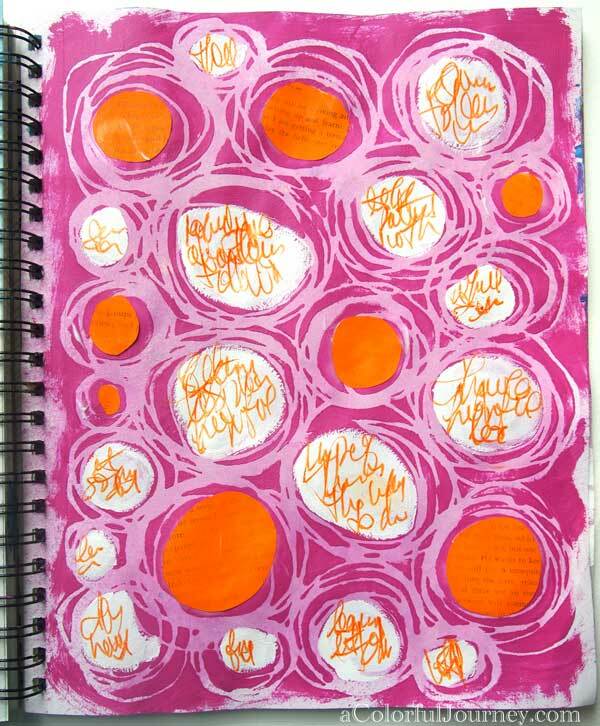 Carolyn..LOVE what you created with my Circles Circles stencil in your art journal..so fun and colorful! Thanks for helping me celebrate the launch of my new stencil collection! I love circles too – can’t wait to try this stencil. So much fun to be had! Love the color combo with those delicious circles!! As always, I enjoy watching your videos and how you create! Love all of Traci’s new stencils!! Love these circle stencils! Cool video and funny too! Can’t wait to get my hands on these new stencils! Love those new stencils! Thanks for a chance to win! those circles POP off the page. I love the colors you used and *that* stencils is awesome! Carolyn, This is so you!! Bright pink and orange!! Hope to see you at the Chicago Create Retreat this year. Thank you for the chance to win! I was looking forward to you take. Always love your style and colors. Such a great page! Thanks for sharing your talent! I love this page – the colors and everything! This stencil is a must have! Carolyn, you always inspire me to have fun! and make me feel good when my left over paint goes over a blank page..to use later. A great way to use the circle stencil..
Just what I’ve come to expect over the last couple of months since coming across your YouTube channel — bright and fun! Every day with you, Carolyn, is a colorful journey! To be honest, when I was drooling over Traci’s new stencils, I didn’t even notice the circles one (until I viewed your post/video). 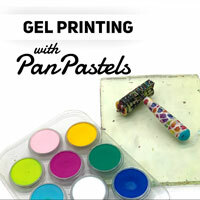 I would love to win Traci’s stencils so I can play with color too! really like what you did with the circles. thanks as always for sharing. LOVE this stencil! And I love how you used it! Pink and orange is such a great color combo. I was waiting for your math formula (my math degree ready to be be used), but I knew better than to expect one:) THose markers were the perfect tough for this! I love this page you did…maybe because I, too, love circles…I love the colors you used and the way you journaled in the circles…very fun! The masks will be oh so much fun. Enjoyed the vid. Love the stencils and love the video and the page you created. Wonderful page!!! Thanks for the supply list! love these and love seeing what everyone is doing with them! Girrrrl! I can’t believe you wanted for something to dry! Beautiful circles with help of Traci! Hot pink and orange, wow! These stencils are awesome! Ok I thought I was a floral stencil girl but after seeing your work, maybe I’m shapes too!!! Such a fab line of stencils. Love those circles! Fingers and toes crossed that I win! Great page. I can’t wait to try something similar. Really like that stencil though. It reminded me of a stencil I made with my glue gun, from your class. Mine was not as detailed, but loved it just the same. Thanks for sharing your work. I like the circle stencil! The way you used it is great with the writing in the circles. Have a great day! What a gorgeous page! I never ever would have put these colors together. Great colors using Traci’s new stencil. I LOVE CIRCLES! Would love to get to play with Traci’s new stencils too. Thanks. I love your pink circles with the pop of orange. Lovely page. I like how you just played with what you had and created something so colorful. That circle stencil looks like a must-have item! I love what you did with this! I was just daydreaming a journal page this afternoon with circles for me to write in. Now to sit down and create it! Thanks for that fun video, Carolyn! I try to emulate Traci, but not successfully, so with a set of these stencils, I think I can do a much better job! Thanks for the chance! It is so much fun to see what you created with Traci’s new stencil! I love it! Oh my! Love what you did with Traci’s stencil! thanks for the inspiration. Just awesome!! I love what u have done with that gorgeous stencil!! Love the circles and such a cute page. I’m a huge fan of circles as well!!! I want to turn your piece into fabric for pete’s sake…it’s fabulous!!! Lovely stencil and adore what you did with it! So sooooooooooo in love with circles… they make me happy.. and so does bright colors and your videos Carolyn!! Thanks for posting and the giveaway opp. Carolyn – LOVE how you used the circle circle stencil!! You always crack me up the way you work. Love it all. I love all the stencils but DO love the easy, free way you used the circle circle stencil. Awesome journal page…great use of the stencils! 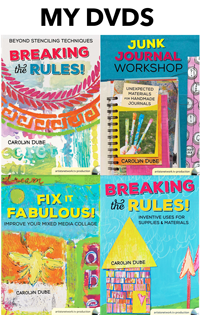 Love what you have done with these fabulous stencils! The circles are cool and so are the posca glitter pens! love what you did with this stencil! Very awesome journal page, Love the colors you used. Great release! Stencils are my favorite, if you know me, you know that I love circles, this new stencil is awesome, would love to win the new stencils, loved your page!!!! Another great fun fix! A super fun video and I love the random circles stencil. Oh and I’d love to win too, but wouldn’t we all. ;-D Good luck to all, I’m going to go play now. Wonderful page, cool stencils. I’d love to win a set! Love the new stencils and your art is so inspiring. I enjoy watching you play. Carolyn, I enjoy your videos! You make art happy and I always look forward to your next video. Thanks for a chance to win this giveaway. Very cool page done with the circles! I am a fan of this stencil now! Love the bright pink and orange combo! Great video! I have to have these new stencils! Wow, Carolyn! Once again – you rocked it!!! I love your page, the bright colors, the text…all of it. And that stencil – I really have to get these new stencils…aren’t they amazing? Who knew you could have so much fun with circles. I’ll have to give this a try. Love what you did with these amazing circles and the orange is the kicker! Love the circles. Think I must have this stencil. Love the color combo you used! I like the way you used the circles. Great inspiration! LOve what you did withthe stencils! Love the circle stencils, love your videos…fresh ideas…. Love the free-flowing form of the stencils. The way you used them in your art journal was great. Fun to fill in the circles with word association. I have recently become addicted to that color combination. Pink, orange and also yellow…love them! This is a great page and Traci’s stencil is too cool. I always love your videos! Thanks for the chance to win! Thanks for the video and the giveaway. Love these stencils! 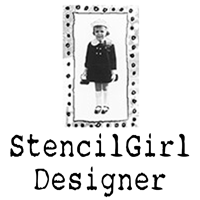 Well, this is probably getting boring for you, but once again… love everything you do and your carefree approach to art making..would so love the opportunity to make some fabulous art with Traci’s new stencils. love love love this journal page! thanks for sharing the video – you make it look so easy. Tried to sign up for the newsletter but it is not accepting any new emails…. I used the box at the bottom and it let me subscribe – thanks! I know the precise formula you used…. 56 x pi divided by 12 then subtract 4. LOL For some reason that cracked me up in your video. Your page is gorgeous and really is fun! 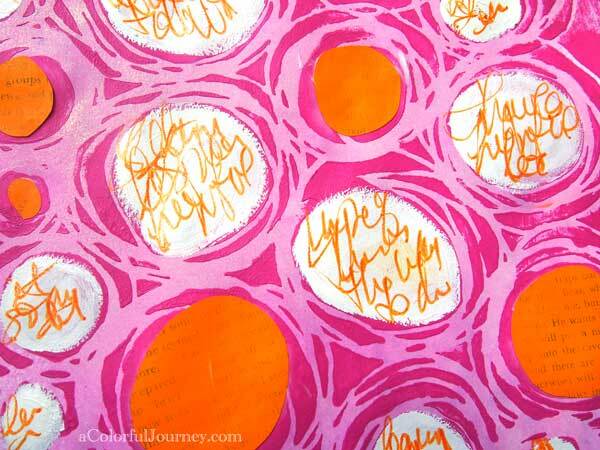 Love the scribbily journaling inside the stenciled circles. Circles are some of my favorite motifs! Great stencil and usage. Thanks for the chance to win. I love those colours Carolyn. Love the stencil too. Thanks for the chance to win it. I love to see how everyone is using these new stencils. Thanks for sharing your creativity with us. 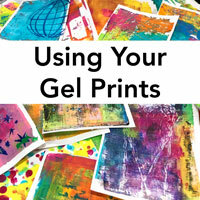 These stencils are fun and your design is fun too! Very cool. Love how you played with the stencils, and I know how you adore color! Running to get my art journal now! I love the various ways you incorporated words into this page. Love Love Love. I’m still a newbie to stenciling and each idea I see gives me inspiration! Carolyn, Thank You for sharing! I’m new to stenciling. I would love to win so I can practice with them. Love your creation! That circle stencil is awesome and I want it! Techniques with stencils like yours. I LOVE stencils!!!!!!! New stencils mean New opportunities to play. What a great stencil! This is definitely on my wish list! I love how you wrote with orange in the white circles. Its the perfect touch for this page. Another great video_so inspiring. The colors are so me. I need to go to a secret hideaway just to paint with these stencils. Love them! Love your colors and circles are my favorite shape! These are beautiful!!! Would love to win the giveaway!! I love the results you had using Traci’s new set of stencils! Really clever way to use the circle stencil. Really clever use of the circle stencil! So simple yet makes me so happy! Thanks once again for the great inspiration and the circles with writing are a terrific idea. I love your fun page and I love watching you ‘have fun’. You really inspire me to just go with it and play and not listen to my inner critic! What a cool stencil. Looks to be fun. Love the colors and circles are my favorites. Yeah for this stencil and way yeah for your creative use of it. Wow Carolyn–I always love your videos, but this one really came together so quickly and successfully. I love circles and text and what a great stencil. Thank you for sharing! Great stencil! Love the page you did, Carolyn. Looks like a fun stencil! Love the Circle Circle stencil! What a great way to cover an old page with some new life. Thanks for the chance to win some great stencils. Haven’t tried stencils yet, but you have my interest piqued! YES * YES, I LOVE TO HAVE FUN, ALSO ~ i need to get some posca pens via mail order SOON… I am EVER SO grateful for the video ! love * love * love circles ! thwarting the inner critic IS very GOOD medicine ! BLESSINGS ! Love this stencil and how you used it. I just love circle stencils and I will have to add this one to my collection! ewwwwwww….you had me at glittery pen, then orange book text and pink on pink scribbly circle? Shoot, I’m in love. It’s always so refreshing watching your videos! Love the circles stencil and how your easy techniques made such a cool page. Yowza! That is bright AND beautiful. Turned out fabulous!!! Traci’s stencils are the bomb! 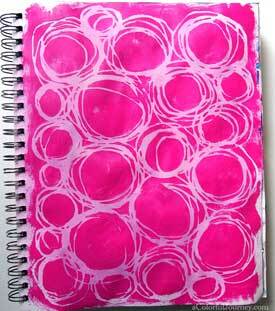 I love how you journaled inside the circles! This circle stencil is my favorite of the set. Aren’t you lucky to play with the new circle stencil. 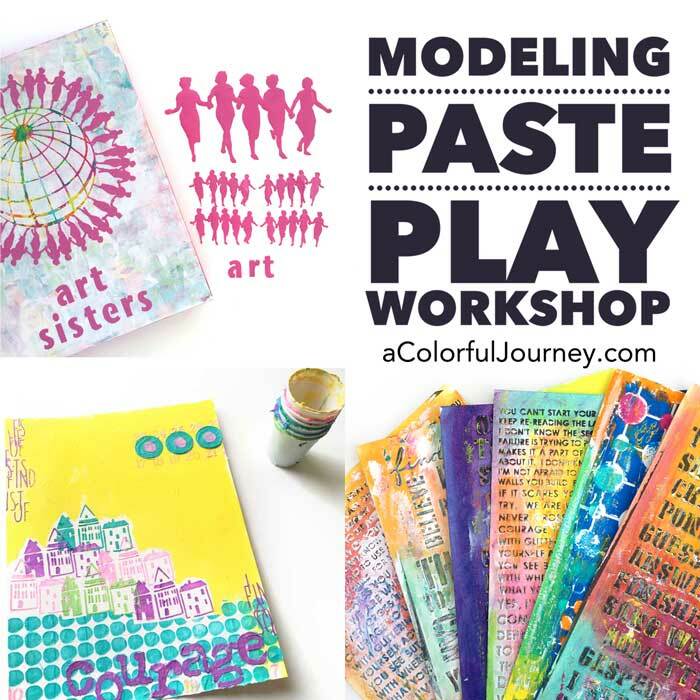 All five new stencils will create hours of art play fun. Thanks for the blog hop and giveaway. Your videos make me feel happy! What is it about circles – love ’em. Thanks for the chance…..
Love, love, love what you did with the circle stencil. Very cool. Glad you’re blog is up and running again!